The MLA Board has voted to provide a new benefit. Through an agreement with American Income Life, each member will receive several no-cost benefits. These include an Accidental Death and Dismemberment Benefit of $2000.00; a Health Services Discount Plan; a Child Safe Kit; and a Family Information Guide. The AD&D benefit requires no action on the part of the member. You should have received a letter about these benefits. There is a response card in the letter, and, if you choose to return the card to the company, you will also receive the additional no cost benefits. You should be aware, however, that if you do return the card, you will be visited by an AIL Representative and be offered additional services, at a cost. Deb Sample, Branch Librarian of Adcock Library, retired after 25 years of service to Holmes Community College in Ridgeland, MS. This culminated a career that got its roots in her high school library where she worked as a library aid. Before coming to Holmes, she worked as librarian at Woodland Hills Baptist Academy in Jackson, acquisitions librarian at Mississippi State College for Women in Columbus and reference librarian at Ricks Memorial Library in Yazoo City for a total of 30 years in service to Mississippi libraries. Sample, an Ocean Springs native, holds an associate’s degree from Mississippi Gulf Coast Community College. She received a bachelor’s degree in library science from Mississippi State College for Women and a master’s degree in library science from the University of Mississippi. She holds memberships in the Mississippi Library Association and the Alpha Beta Alpha Fraternity and is past District chairman with the Mississippi Private School Association. She was also named Lamplighter at Holmes Community College. She plans to spend retirement researching her genealogy, cultivating new hobbies, and traveling to visit friends and relatives. She has a grown son, Michael Sample, and three grandchildren. The Board of Trustees of First Regional Library has announced the appointment of Ed Hughes as the new Director. Mr. Hughes has a Bachelor of Arts and a Masters in Library Science, both from the University of Wisconsin. In his 30-plus career as a librarian Ed has worked for both academic and public libraries in areas he calls “cowboy country” including Idaho, Wyoming, Nebraska, and South Dakota. He comes to Mississippi from Wisconsin, where he has been serving as director of the Rhinelander District Library since 2008. His other positions during his career include Circulation-Technical Services Supervisor at the Rapid City Public Library where he assisted with the opening of a new branch and an expansion to the main library. He was also the library’s network contact with overall responsibility for migration to a new integrated library system. Ed’s other library experience includes stints in Acquisitions at the University of Wisconsin and as Head of Cataloging at the College of Southern Idaho Library. Ed follows Catherine Nathan, who retired as Director in October 2013, and Judy Card, who has been serving as Interim Director. He begins his FRL career on June 2nd. The Association of Southeastern Research Libraries (ASERL) announces the development of “Deeply Rooted,” a new, shared digital collection focusing on the rich agricultural and rural histories of its member institutions. This project builds on the work of Mississippi State University Libraries’ Consortium for the History of Agriculture and Rural Mississippi (CHARM), especially with regard to online digital content and the subjects of agricultural and rural history. As with the Civil War project, ASERL seeks to enable broad participation of member institutions in the “Deeply Rooted” collection. This collection will contain content that describes economic, technologic, and social factors significant to the development of agricultural practices, crops, technology, and agrarian life in the regions of the contributing institutions. The Digital Public Library of America (DPLA) will serve as the main portal for this Deeply Rooted collection, which is projected to be online by the end of 2014. Mississippi State University Libraries will provide leadership on the steering committee, harvest and normalize the metadata and serving as a liaison to DPLA for this effort. “We are thrilled that the Deeply Rooted project is underway and will provide researchers with access to these primary resources. Making them available through the DPLA will make the resources more discoverable to researchers around the world,” said Frances Coleman, Dean of MSU Libraries. This will be the second shared digital collection created under the ASERL umbrella. In 2011, ASERL launched American-south.org, an online portal to a shared digital collection of Civil War Era content. This collection contains more than 10,000 items from more than 30 libraries and has attracted more than 55,000 visitors since its launch. For more information on the project contact John Burger, ASERL Executive Director (jburger@aserl.org); Frances Coleman, Dean of Libraries, Mississippi State University; Stephen Cunetto, Administrator of Systems, Mississippi State University Libraries. Hundreds of people showed their support to the Winona-Montgomery County Library, a branch of the Mid-Mississippi Regional Library System, in honor of National Library Week. The annual Tasters’ Luncheon was held Thursday, April 24, 2014, and Mississippi First Lady Deborah Bryant was the event’s keynote speaker. Bryant, who started her “Read Across Mississippi Initiative,” read to students at Winona Elementary School prior to the Tasters’ Luncheon. Bryant also spoke of her H.O.M.E. initiative, her plan named for the four issues she is focusing on during her time as First Lady: Healthcare, Outdoors, Mansion, and Education. Bryant added that since her husband, Phil Bryant, took over as governor, there has been a 10 percent drop in the teen pregnancy rate. The “O” and “M” is for her love of the outdoors and what she calls “great state parks” and the preservation of the Governor’s Mansion. With “E” Bryant is a firm believer of a strong education system in Mississippi and lends her time and effort to supporting schools throughout the state. To accommodate the large number attending, the luncheon was held at the Moore Memorial Methodist Church Family Life Center with dozens of southern dishes featured on the buffet. Sponsored by the Friends of the Library, the luncheon featured dishes prepared by Friends’ members, and the collection of recipes served at the event was given to each person in attendance. 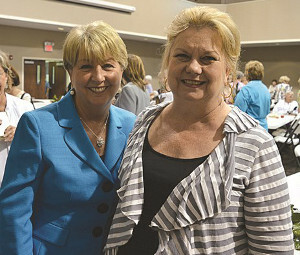 Deborah Bryant (pictured with Senator Lydia Chassaniol, R-Winona) was the keynote speaker at the Winona-Montgomery County Public Library Tasters’ Luncheon on Thursday, April 24, 2014. Article and photograph by Reggie Ross, The Winona Times. Reprinted with permission. Rowland Medical Library at the University of Mississippi Medical Center recently opened the Collaborative Learning Center (CLC). Occupying space that previously held a computer lab, the CLC features seven flat screen monitors and MediaScape furniture including three collaborative tables, movable chairs, desks and booths. The CLC, designed to support inter-professional and collaborative learning, opened in December 2013. It is open to students and faculty of all campus schools during library operating hours. Susan Clark, Connie Machado and Lauren Young presented a poster about the project at the 2014 Medical Library Association annual meeting in Chicago. Connie Machado, Associate Director, has received an award on behalf of the Archives division of Rowland Medical Library/UMMC. The 2014 NN/LM Express Digitization and Conservation Award will be used to purchase necessary equipment for the evaluation of over 300 16mm surgical films, many from Dr. James D. Hardy. Dr. Hardy first transplanted a chimpanzee heart into a human and also performed early lung transplants and adrenal gland surgeries. The equipment purchased will include hand rewinds, splicing equipment, and a light table, along with archival film cases and cores to properly evaluate and store the films that are in the process of being considered for preservation. Films must be evaluated for content, chemical instability, decomposition, shrinkage, splices and value for preservation potential. Melissa Wright, MLIS, PhD, reference and instructional services librarian at Rowland Medical Library, received a grant to attend in a course in agricultural medicine (Agricultural Medicine: Occupational and Environmental Health for Rural Health Professionals) offered by the North Carolina Agromedicine Institute. The course addressed multiple areas of rural medicine such as pesticide exposure, farm injuries, and farm equipment safety and met face-to-face twice in Greenville, North Carolina, with additional class sessions held online. The grant was funded through a training award from the National Network of Libraries of Medicine, Southeastern/Atlantic Region and was available to four librarians who serve agricultural populations in one of the southeastern states. Recipients of the grant will share information on agricultural health resources with their institutions and communities.